What is Men’s Health and Why is it important? Men’s Health is about exploring the causes and factors behind what makes boys and men healthy, or not healthy, in Australian society. ‘Health’ is a dynamic reality shaped by many factors. An individual’s health is the product of many aspects of their life. Many of the problems and issues we see that impact on the health status of men and boys in Australia are the results of compromised life environments. The nature of these environments is that they are inter-connected so damage to one environment often results in cumulative stress and health deterioration. These environments include early childhood, education, work, relationships, housing, food choices, transportation and social connections. 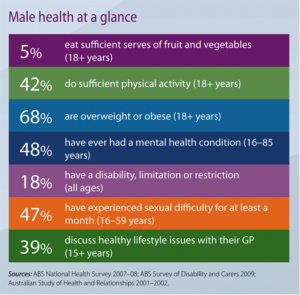 The table below gives an interesting snapshot into the health of our Australian boys and men. Men’s health has become an important issue for several reasons. Throughout life, males experience higher rates of illness, accidents and premature deaths than their female counterparts. At The Psych Professionals, we have psychologists determined to make a difference to the health (both physical and emotional) of our male clients. The biggest challenge for males generally is to recognise that they need support and that it is OK to admit and accept such.